Influenza is a serious disease that can spread around the world in seasonal epidemics, resulting in the deaths of an estimated 250,000 to 500,000 people every year . Vaccination is the most effective method for preventing secondary complications and the risk of influenza-related hospitalisation and death. The influenza vaccine is safe in general, and the most common side-effects, such as injection-site reaction, pain, fever, myalgia and headache, are not important clinically . However, a few case reports of interstitial lung disease (ILD) caused by influenza vaccine have been published. We report a case of influenza vaccine-induced ILD with a review of the literature. A 75-yr-old female was referred to our hospital (Komatsu Municipal Hospital, Komatsu, Japan) for evaluation of fever and chest radiograph abnormalities in November 2011. 2 weeks previously she had received the influenza vaccine (trivalent inactivated vaccine: A/California/7/2009 [H1N1]-like, A/Victoria/210/2009 [H3N2]-like, and B/Brisbane/60/2008-like antigens). She had developed a fever 1 week before admission, and a chest radiograph revealed patchy airspace infiltrates in both lungs (fig. 1a). She received garenoxacin without any improvement and was then referred to our hospital for further evaluation. She had a medical history of hypertension, anaemia and chronic renal failure due to diabetes, and had started regular haemodialysis at the age of 74 yrs. She had no past history of pulmonary disease and her chest radiograph the previous month was normal. Her medications included valsartan, furosemide, isosorbide dinitrate and cilnidipine, which had remained unchanged for 2 yrs. She also had an insulin injection every day. She was a nonsmoker and had no allergies to foods or drugs. 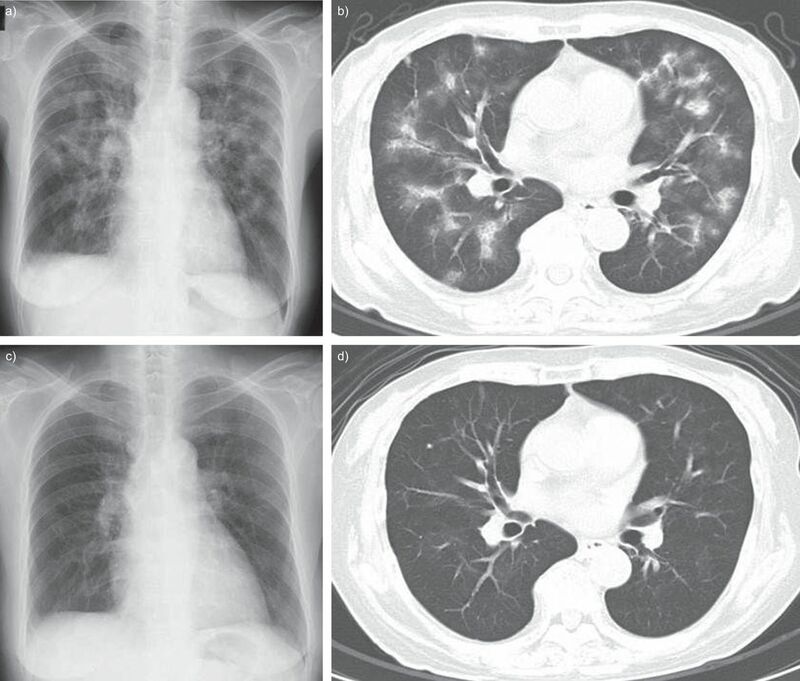 a) Chest radiograph showing patchy airspace infiltrates in both lungs. b) Chest computed tomography (CT) image showing bilateral ground-glass opacities and patchy infiltration in predominantly peribronchial and subpleural distribution. c) Chest radiograph and d) CT after 4 weeks of follow-up showing almost complete resolution of the bilateral opacities. On examination her blood pressure was 154/47 mmHg, heart rate was 98 beats·min−1, oxygen saturation was 96% on room air and her temperature was 37.7°C. Physical examination revealed no abnormalities. Chest computed tomography (CT) revealed bilateral ground-glass opacities and patchy infiltration in a predominantly peribronchial and subpleural distribution (fig. 1b). Laboratory findings revealed C-reactive protein of 5.5 mg·L−1 and lactate dehydrogenase level of 539 IU·L−1. Serology tests for several autoimmune markers and tumour markers were negative. The serum levels of Krebs von den Lungen-6 (KL-6), surfactant protein-D (SP-D) and surfactant protein-A (SP-A) were increased to 1,720 U·mL−1 (normal range <500 U·mL−1), 924 ng·mL−1 (normal range <110 ng·mL−1) and 115 ng·mL−1 (normal range <43.8 ng·mL−1), respectively. Pulmonary function tests were: forced vital capacity (FVC) 1.46 L (normal range 68.2% predicted); forced expiratory volume in 1 s (FEV1) 1.31 L (normal range 95.6% pred); FEV1/FVC ratio 89.7%; and diffusing capacity of the lung for carbon monoxide 5.52 mL·min−1·mmHg−1 (normal range 28.2% pred). There were no abnormalities seen on echocardiography. The findings of the bronchoalveolar lavage (BAL) fluid revealed 45.0% macrophages, 52.7% lymphocytes, 0.3% neutrophils and 2.0% eosinophils. The CD4+/CD8+ ratio of lymphocytes was 1.18. BAL fluid cultures for bacteria, fungi and mycobacteria were negative, and cytology was unremarkable. Transbronchial lung biopsy (TBLB) specimens revealed interstitial inflammation with lymphocytes, mild interstitial fibrosis, and reactive hyperplastic type II pneumocytes. There were no findings of infection, granuloma or malignancy. These findings were consistent with a diagnosis of ILD. Based on the clinical course, a possible cause was influenza vaccination. The temporal relationship between influenza vaccination and clinical symptoms argued strongly for a causative role of this agent. Several evaluations support the assessment that the ILD could not be explained by other causes, including infections, collagen vascular disease, granulomatous or pulmonary oedema. A drug lymphocyte stimulation test (DLST) on her peripheral lymphocytes gave a positive reaction to the influenza vaccine with a stimulation index of 296% (normal range <180%). She was started on oral prednisolone at 30 mg daily. Her symptoms and laboratory data were remarkably improved (C-reactive protein 0.1 mg·L−1, lactate dehydrogenase 207 IU·L−1, KL-6 175 U·mL−1, SP-D 17.2 ng·mL−1, SP-A 60.9 ng·mL−1), and the repeated chest radiograph and CT demonstrated almost complete resolution of the bilateral opacities (fig. 1c and d). Prednisolone was then subsequently tapered and was withdrawn at 2 months. She has been observed without recurrence. Influenza vaccine-induced ILD is rare, and very few studies have focused on the disease. According to the vaccine adverse event reporting system established by the Centers for Disease Control and Prevention and the Food and Drug Administration between 1990 and 2011, only three cases of ILD after influenza vaccination have been reported . However, details of the cases were not listed. A review of the literature found a total of six cases of influenza vaccine-induced interstitial lung disease (table 1) [4–9]. Including the present case, the median age was 59 yrs and four patients were male. The time of onset was 1–2 days after vaccination in four patients and 6–10 days in three patients. Four patients had pre-existing lung diseases, including lungs in the post-operative state. The common clinical symptoms included fever (n=6) and dyspnoea (n=5). The findings of chest CT scans were bilateral ground-glass opacities and/or patchy infiltration. All patients recovered after treatment with corticosteroids and survived. However, the ILD of cases 4 and 5 became severe, and aggressive treatments, including mechanical ventilation, were required. The mechanism of drug-induced ILD is not well understood. However, two mechanisms have been proposed: cytotoxic lung injury and immune-mediated lung injury . In our patient, immune-mediated reaction of the lung to the vaccine was suspected, based on the lymphocytic alveolitis in the BAL fluid and TBLB, efficacy of corticosteroid, and a positive DLST. These findings are consistent with other cases. TBLB performed in two cases (cases 3 and 6) revealed interstitial lymphocyte infiltration. All cases were improved by corticosteroids. DLST was performed in two cases (cases 3 and 6) and both were positive. DLST measures the proliferation of T-cells to a drug in vitro . Although data as to the sensitivity and specificity of the DLST is lacking and it is not always helpful for the diagnosis of drug hypersensitivity, in this case there was immune-mediated reaction of T-cells to the vaccine. From the literature review, we hypothesise about some risk factors for ILD. First, pre-existing lung disease, including lungs in the post-operative state, may be a risk factor. Four patients had pre-existing lung disease and especially case 5 developed an acute exacerbation of idiopathic pulmonary fibrosis. Secondly, pandemic influenza A (H1N1) vaccine may be associated with the occurrence of ILD. Three patients (case 4, 5 and 6) were given monovalent H1N1 vaccine, and our patient was given a vaccine which contains H1N1-like antigen. Finally, genetic background may be a risk factor, because most of the cases are reported from Asia. However, the limitations of this review include the small number of cases reporting bias and incomplete information in several sources of data. To evaluate the association between influenza vaccine-related ILD and these factors, further clinical or observational studies in more patients are needed. In conclusion, influenza vaccination is the most effective and safe method for preventing influenza-related serious events. Clinicians should be aware of the risk for ILD induced by influenza vaccine. It may become serious without treatment, but early detection and treatment lead to complete remission. Careful clinical history and examination are needed in any vaccinated patients with unexplained fever and/or dyspnoea. We would like to thank J. Fukuoka (Laboratory of Pathology, Toyama University Hospital, Toyama, Japan) and H. Minato (Dept of Pathology and Laboratory Medicine, Kanazawa Medical University, Kanazawa, Japan) for their valuable comments on the lung biopsy findings. We also thank J. Luis Espinoza (Dept of Hematology and Oncology, Kanazawa University Graduate School of Medicine, Kanazawa, Japan) for translating one article from German into English. World Health Organization. Influenza (Seasonal). Fact sheet no. 211. April 2009. www.who.int/mediacentre/factsheets/fs211/en/index.html Date last updated: April 2009. Date lase accessed: August 2, 2012.
. Safety of trivalent inactivated influenza vaccines in adults: background for pandemic influenza vaccine safety monitoring. Vaccine 2009; 27: 2114–2120. US Department of Health and Human Services. Vaccine Adverse Event Reporting System (VAERS). http://vaers.hhs.gov/index Date last updated: October 15, 2012. Date last accessed: August 2, 2012.
. Pneumonitis secondary to the influenza vaccine. Postgrad Med J 1998; 74: 541–542.
. Allergische Alveolitis nach Grippeschutzimpfung [Allergic alveolitis after influenza vaccination]. Pneumologie 2009; 63: 508–511.
. [Interstitial pneumonitis caused by seasonal influenza vaccine]. Nihon Kokyuki Gakkai Zasshi 2010; 48: 739–742.
. Possible life-threatening adverse reaction to monovalent H1N1 vaccine. Crit Care 2010; 14: 422.
. Acute exacerbation of idiopathic pulmonary fibrosis after pandemic influenza A (H1N1) vaccination. Intern Med 2010; 49: 2333–2336.
. [Case report; drug induced lung injury caused by 2009 pandemic H1N1 vaccine]. Nihon Naika Gakkai Zasshi 2011; 100: 3034–3037.
. Drug-induced interstitial lung disease: mechanisms and best diagnostic approaches. Respir Res 2012; 13: 39.
. The lymphocyte transformation test in the diagnosis of drug hypersensitivity. Allergy 2004; 59: 809–820.